Intel has been saying for over a month now that their chips would show up in a budget tablet this holiday season and that has finally happened. The HP Mesquite Android tablet is now available at that temple of gadgetry, Walmart. 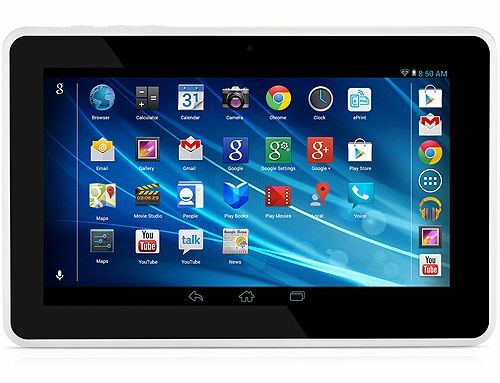 The Mesquite tablet runs Android 4.1 on a 1.6 GHz Intel Atom Z2640 CPU with 1GB of RAM, Wifi, Bluetooth, and a VGA webcam. It also has 8GB of storage, a microSD card slot, and a single speaker on the back. The 7" screen has a resolution of 1024 x 600, the same as on many other 7" tablets in this price range. The tablet measures 7.6" x 4.9" x 0.4", weighs about 13 oz, and is specced at 5 hours of battery life. This tablet was initially released on Black Friday at $89, but it is selling today at $99. I bought one of these tablets on Black Friday, and while it's not the best tablet I have seen it's also not the worst. I plan to post a review this weekend, but for now I can say that the Mesquite tablet has a more polished hardware design than many of its no-name competition, though it lacks the HDMI port which is growing increasingly common on budget tablets. The Mesquite is running a stock version of Android that is less polished than some sub-$100 tablets like the ones from Ematic. It also has unimpressive benchmark test results. That's not necessarily a strike against the tablet, but it's also not a point in its favor. Please don't take the above as being unnecessarily negative; the HP Mesquite is still in the running for my choice for best value under $100. Odd that nobody seems to be reviewing this. The only thing I’ve seen is some forum comments saying that it seems very fast, but that many apps won’t run. It was only first available on Thursday of last week so there hasn’t really been enough time to get a review out. I don’t feel I can post a review without a week of use, so my review won’t be up until Saturday. Where were you reading these forum comments? I saw a few others, but I can’t find them now.